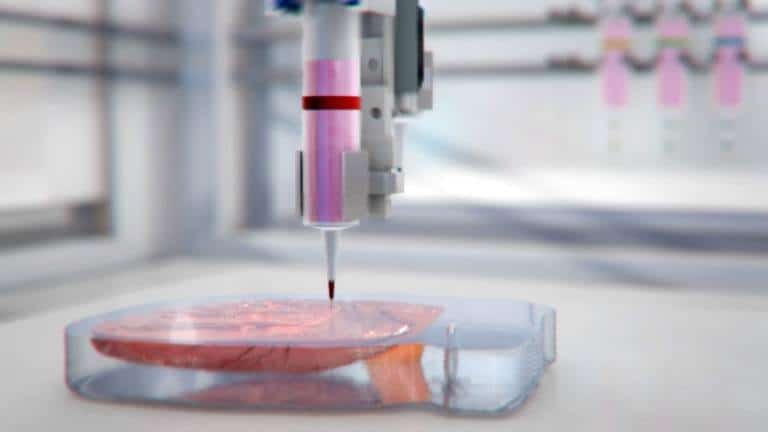 Chicago-based biotech company BIOLIFE4D announced this week that it has successfully 3D bioprinted a human cardiac tissue patch, bringing the company a small step closer to its ultimate goal of 3D bioprinting a viable and transplantable human heart. In the world of bioprinting, many tend not to look past a headline, leading some to believe that 3D printed transplantable organs are close on the horizon. And while we know this isn’t quite the case—it is still interesting to track what bioprinting companies whose goal it is to print organs are up to. BIOLIFE4D is one such company and it is undoubtedly excited to have achieved an important milestone in its bioprinting research. According to the biotech firm, it successfully demonstrated its ability to bioprint a cardiac patch just days after the opening of its new JLABS research facility in Houston in May. The bioprinted tissue reportedly contains multiple cell types (as opposed to just cardiomyocytes), similar to a real human heart and integrates “preliminary vascularization.” Spearheaded by Dr. Ravi Birla, Chief Science Officer of BIOLIFE4D, the innovative bioprinted cardiac patches could be used to restore myocardial contractility in patients with acute heart failure. The speed at which BIOLIFE4D succeeded in bioprinting the cardiac patches seems to have come as a surprise to the company itself, as most research indicates that bioprinted human cardiac patches require six to eight months to develop. With the promising early start, the company says it will now begin to focus on other constructs including valves, blood vessels and a mini heart. BIOLIFE4D says its bioprinting process enables scientists to “reprogram” a patient’s white blood cells to iPS cells (a type of stem cell) and then into different types of cardiac cells. These are then bioprinted into tissue patches and perhaps one day into viable human hearts. Obviously, the implications of being able to 3D bioprint a transplantable human heart are massive, especially as heart disease is the leading cause of death in the United States. But again, it will likely be a long time before we hear of the world’s first bioprinted heart transplant.